A crash outside a London museum that injured 11 people was not terror-related, police have said. A black Toyota Prius hit the people outside the Natural History Museum in Exhibition Road, South Kensington. Video footage that emerged on Twitter showed a man, believed to be the driver, being restrained on the ground. 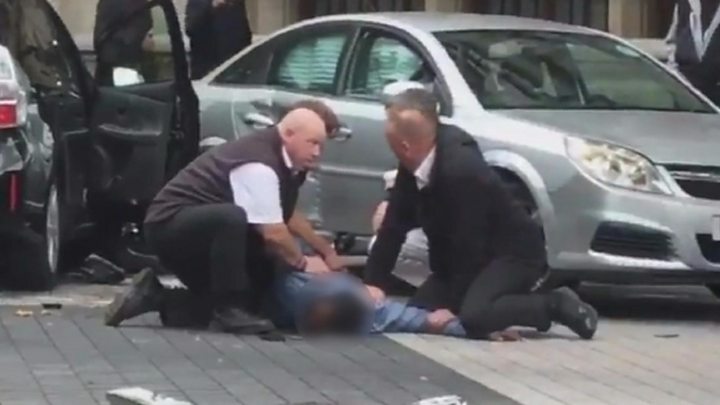 The Metropolitan Police later said the incident was thought to be a "road traffic collision" and a man in his 40s had been arrested at the scene. He was arrested on suspicion of dangerous driving and received hospital treatment before being taken to a north London police station for questioning. London Ambulance said the people it treated - including the detained man - had mostly sustained head and leg injuries. Nine were taken to hospital. Prime Minister Theresa May tweeted her thanks to first responders and members of the public, adding: "My thoughts are with the injured." London Mayor Sadiq Khan also tweeted his thanks and hopes for a "swift recovery" for those injured. "For Londoners and visitors planning to visit our excellent museums and attractions in the area, please be assured they will be open as usual tomorrow." The current terror threat in the UK is at "severe" - the second highest level - meaning an attack is highly likely. Oliver Cheshire, a model and popstar Pixie Lott's fiance, was involved in helping hold the man down after the incident. He tweeted: "I'm OK. Thank you to the men who helped me pin him down and the police for coming so quickly." 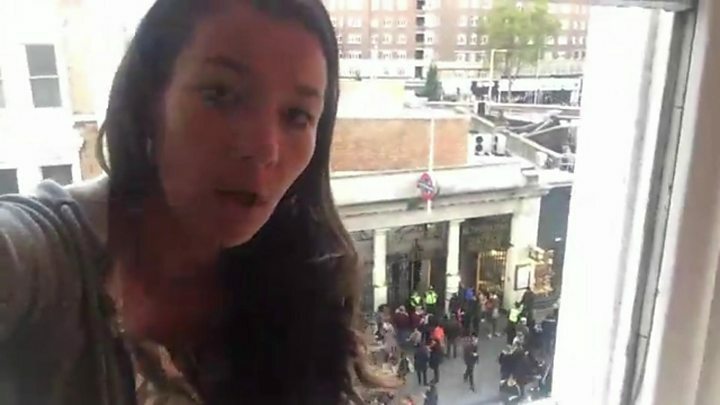 BBC reporter Chloe Hayward, who was leaving the Natural History Museum as the crash happened at 14:20 BST, said she saw a car "diagonally across the road", looking like it had hit a bollard, before armed officers arrived. We have been to the south end of Exhibition Road nearest the Tube and the area, normally a busy destination for Saturday afternoon dining by locals and tourists, is deserted. Eyewitnesses told us that police came rushing into each bar and restaurant and told people to get out. We can see coats on chairs - some knocked over - half-eaten meals and half-drunk glasses of wine. Police helped one restaurant owner to recover staff belongings, like house keys, because it was unclear when the area would reopen. 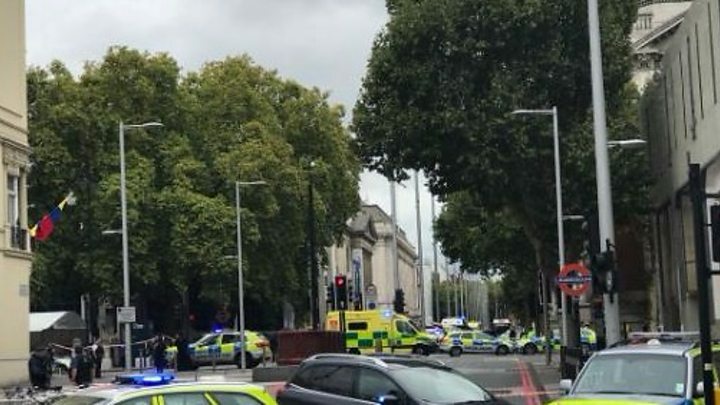 An eyewitness who was walking to the Science Museum said: "When waiting for the light, we heard what I thought was gunshots and saw a car drive over the pavement. We just ran. My friend dived on the floor and cut her hands." The woman, who asked to remain anonymous, said: "When it calmed down we walked back to where we'd been and saw a gentleman on the floor being restrained by police." Media captionEllie Mackay, who lives opposite South Kensington tube station, said she heard "a couple of loud bangs"
Connor Honeyman, from Essex, who was in the queue for the museum, said: "We heard a horrible thudding noise and a car engine. Everyone started running and screaming inside. "We ran in, everyone was following us, and then all the security guards ran out and they closed the main entrance. There was much confusion before the police got there."